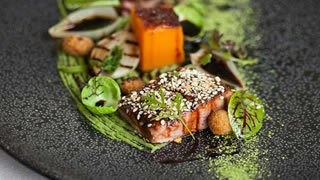 The Restaurant at Grande Provence is located on one of the most beautiful heritage estates in Franschhoek. Grande Provence wears her 300 year history with dignity. Sitting in the magnificent Franschhoek Valley in South Africa’s Western Cape, the lush vines of Grande Provence spread across 47 acres with gentle vistas over the valley floor. Executive Chef, Darren Badenhorst, leads the kitchen team to achieve the highest standards and recognition as one of the finest restaurants in South Africa. High-backed chairs upholstered in white leather draw the eye to the centre of the deep blue-grey hand-plastered walls, while deeply recessed windows frame the picturesque view from the interior – Grande Provence Restaurant in Franschhoek offers understated luxury. Crisp white linen napery criss-cross the table tops and the polished glasses and cutlery gleam with care and attention. During the winter months the flickering light of a log fire joins the candlelight to enhance the warmth and attentive hospitality at The Restaurant at Grande Provence. Grande Provence Restaurant in Franschhoek has been the proud recipient of many awards which is considered to offer one of the finest dining experiences in South Africa. Private Dining options are also available at the Grande Provence estate in the historic Jonkershuis for up to 30 guests. Special gourmet dinner events are also held here during the year. The Wine Cellar is an atmospheric venue for private dinners, especially by candle light.